The problem is with the chemical inside the airbag inflator that works to inflate the airbag during a crash. It becomes unstable after years of exposure to moisture and temperature fluctuations. In a crash, if the airbag may blow apart sending pieces of metal into the vehicle and potentially cause injury and death. For other vehicle, only the driver side is affected while others both Passenger and Driver Side. How would I know if my vehicle is affected by this recall? Visit our website's Recall Information page and input your vehicle's Chassis/VIN number at the Search box. It will tell you if your vehicle is affected or not. How long will it take to replace the SRS Airbag inflator? It will take only about one (1) hour for one side and two (2) hours for 2 sides. Can the affected car owners bring their car anytime for repair? It is advised that customers first call their respective dealers or Honda Cars Philippines hotline for an appointment and to avoid any inconveniences. What shall we do while waiting for the repair schedule? We advise to practice extra precautions to avoid accidents. How many units are covered in this recall? About 100,000 units manufactured and distributed in 2003 to 2014. How the affected units were identified? Honda identified the affected vehicles based on the airbag module ID numbers. 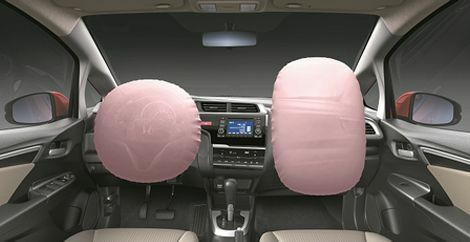 Consequently, all airbag produced during the specific period when there was suspected problem on manufacturing process could be traced. From these airbag module ID numbers, the specific frame numbers where these affected airbags had been installed could likewise be identified. Why does Honda take the market action? The market action was decided because the inflator containers could rupture and the component parts could pop out through airbag cushion material at the time of airbag deployment possibly causing injury to vehicle occupants. How is Honda addressing these repeated airbag recalls/campaign? Honda is taking it very seriously and taking a sincere effort to prevent the same problem from happening again in the future. Was there any occurrence reported? There was no reported injury for Philippine market. Is this a mistake made by the supplier side? This is a manufacturing-related problem in the supplier during the production process. Is the recall affecting other countries? Yes, this also affects other countries. What is Honda’s reoccurrence prevention countermeasure for the future? We have confirmed that the supplier has taken recurrence prevention measures in their production process properly for our vehicles manufactured after the affected period. What is Brake Service Package? It is a basic maintenance service for your Out-of-Warranty Honda car. Primary task to be done is to check the brake system of your car. What model does it cover? It covers all Honda car models. Can I avail the package even if my car is still under Warranty? No, for under Warranty units, we recommend you to follow the prescribed full Preventive Maintenance Service to prevent voiding your Warranty. If there are parts to be replaced, is it covered already? No, any parts and additional jobs not covered by the package are subject to additional charge. What are the advantage/benefits of availing this service? The service is available in all authorized Honda Cars dealerships. For the customer's convenience, we suggest you set an appointment with your desired dealership. What is Honda Change Oil Package? It is a basic maintenance service for your Out-of-Warranty Honda car. Primary task to be done is to replace your engine oil. It covers all Honda car models except for Diesel variants. No, for under Warranty unit, we recommend you to follow the prescribed full Preventive Maintenance Service to prevent voiding your Warranty. What types of oil do you use? How much oil is included in the package? Is labor already included in the package? Labor charge for change oil is already covered, additional charging will only take place if there are other jobs to be requested. If I use higher types of oil such as Semi or Fully, will it prolong my change oil interval? e.g. from 6 months to 1 year? No, as per Honda standards, Change Oil interval should be every 6 months or 10,000 km whichever comes first. What is a Sure Save voucher? It is a Preventive Maintenance (PM) discount voucher to be used during PM schedule. The discount increases every two (2) PM visit and is exclusively for Honda PM Parts, Lubricants and Labor only. How much is the discount? How does it increase? The entry level is the Topaz voucher which covers (2) PM visits at 15% off on PM Parts and Lubricants and 10% off on PM Labor. Once the Topaz voucher has been completed, the voucher will be upgraded to Ruby. The Ruby voucher covers (2) PM visits at 20% off on PM Parts and Lubricants and 10% off on PM Labor. Once the Ruby voucher has been completed, the voucher will be upgraded to Diamond. The Diamond voucher covers (2) PM visits at 30% off on PM Parts and Lubricants and 10% off on PM Labor. Once the customer reached the Diamond voucher, the customer will continuously enjoy the 30% PM Parts and Lubricants discount as long as the customer continuously go to dealer for PM on time and avail the complete PM Parts and Lubricants. Every PM visits must be within the allotted period or within 6 months PM visit interval, otherwise the voucher will be void. How much is the Sure Save voucher? The entry level is the Topaz voucher which costs Php 300. Each voucher has a Php 300 off stub which can be used to upgrade to the next level voucher once the first two stubs has been used. What if I miss my 2nd visit using the Topaz voucher? You may use the Php 300 off stub to avail a new Topaz Voucher This goes with Ruby and Diamond voucher also. What if the Topaz voucher was lost? In case the Topaz voucher gets lost, the customer needs to purchase a new voucher and need to complete two (2) PM visits again within the allotted period. What if the Ruby or Diamond voucher was lost? In case the Ruby or Diamond voucher gets lost, the customer needs to purchase a new Topaz voucher and need to complete two (2) PM visit again within the allotted period. It is a basic maintenance service for your Out-of-Warranty Honda car. Primary task to be done is to check the engine condition of your car. Older models that utilize timing belts and carburetor, this includes Honda car models below year 2000. The service is available in all authorized Honda Cars dealerships nationwide. For the customer's convenience, we suggest you set an appointment with your desired dealership.